8/27 Cup of Coffee: The GCL Red Sox grabbed their 40th win of the season behind another solid outing from Logan Allen. Jake Drehoff (pictured) also turned in a marvelous start for Greenville. The Drive also saw some good offensive performances from Yoan Moncada, who homered, and Michael Chavis. Allen Craig added a long home run drought in Pawtucket as part of a walk-off win for the PawSox. Sam Travis also stayed hot, pushing his batting average over .300 with Portland. The PawSox were able to squeeze out a walk-off win at McCoy Stadium in 10 innings. Jonathan Roof did the honors, singling home Allen Craig in the bottom half of the 10th. Roof also added a double and two walks earlier in the game. Craig also had a good night, adding a home run, his first since June 17, as part of a 2 for 5 night. Deven Marrero continued to swing the bat well by going 2 for 4 with a walk and an RBI. Mike Miller also went 2 for 4. 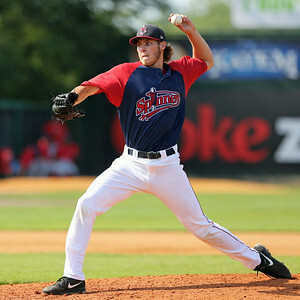 Zeke Spruill started and pitched pretty well. He gave up three earned runs while walking three and striking out six over six innings. The bullpen for Pawtucket was rock solid, as Keith Couch tossed 3 1/3 innings of scoreless ball. He did not allow a hit, walked two, and struck out three. Pat Light was credited with the win, getting the final two outs of the 10th inning. The Sea Dogs had a big night offensively, led by Sam Travis who recorded his second straight multi-hit night. He went 2 for 3 with a triple, a single, a walk, an RBI, and a run. According to Kevin Thomas of The Portland Press Herald, Travis' triple was very close to a home run, and he thinks it might have been overturned if there was replay in the minor leagues. Luis Martinez also had a good night, going 2 for 4 including a go-ahead three-run double in the third inning. Tzu-Wei Lin, Tim Roberson, and Dustin Lawley also added two-hit games. Roberson and Manuel Margot had doubles. Luis Diaz picked up his second win of the year by going 5 1/3 innings allowing just one earned run (three total). He gave up three hits, four walks, and punched out six. Heri Quevedo picked up his first save of the season by pitching 3 2/3 tremendous innings. He allowed just one hit and one walk while giving up no runs. He struck out four, and apparently showed off some great stuff. The Salem bullpen could not hold a one-run lead late, as German Taveras struggled in the seventh inning. He gave up five runs (two earned) on three hits and three walks. Teddy Stankiewicz started and turned in a quality start. He went six innings, allowing three runs on four hits. His control was an issue, however, walking five batters and striking out just two. Chandler Shepherd pitched two scoreless innings in relief while punching out three. Down 3-0 in the fifth, the Red Sox finally got some offense going. Kevin Heller had an RBI single, which was followed by a three-run home run from Mario Martinez. The homer was his fifth, and first since coming off the DL. Heller ended the game 2 for 4, as did Yoilan Cerse, who added a walk. Deiner Lopez was also 1 for 3 with a walk. The Drive got an outstanding mix of offense and pitching in this one. Jake Drehoff made his sixth start of the year and was terrific. He went six scoreless innings and allowed just two hits. He did not walk a batter and struck out four. After the first batter of the game singled, Drehoff retired the next 15 batters in a row before another single in the sixth. His ERA is down to 2.74 on the season in 62 1/3 innings. Jeffry Fernandez came on and worked two scoreless innings of his own, allowing just a hit and a walk. Ryan Harris closed it out in the ninth to finish off the shutout. Yoan Moncada got things started in the first inning with a leadoff blast, his eighth home run of the year. He also walked twice and scored twice. Michael Chavis also had a good night, going 2 for 4 with a pair of doubles, an RBI, and two runs. We've seen the power from Andrew Benintendi, but tonight he showed off some other skills. He went 1 for 3 with a single, a walk, a stolen base, and two runs scored. One of his runs came on a wild pitch. Bryan Hudson went 3 for 4 with a couple of doubles as well. The Asheville Tourists lost tonight as well, meaning Greenville has picked up a game in the standings and is now just 1.5 games back of a playoff spot with 12 games remaining. The Spinners broke out offensively, scoring multiple runs in three different innings. Josh Ockimey belted his fourth home run of the season in the third, a three-run shot that put Lowell on top 3-1. He would add a pair of walks later in the game. Tate Matheny added a two-run single in the fifth inning. Tyler Spoon went 2 for 4 with a double and two runs. Jeremy Rivera also went 2 for 4. Victor Acosta went 1 for 3 with an RBI, and Mitchell Gunsolus and Jhon Nunez each went 1 for 3 with a walk. Javier Rodriguez started for Lowell and went the first 4 2/3 innings, allowing three earned runs on four hits, two walks, and three strikeouts. Daniel Gonzalez picked up the win and pitched extremely well in relief. He went the final 4 1/3 innings without allowing an earned run. He walked just one and struck out three. Lowell is now a game behind West Virginia in the wild card standings, with State College sandwiched between the two at a half game out. The GCL Red Sox won their 40th game of the season for the first time since 1994, when an 18-year old Carl Pavano was a member of the team. They have won two in a row and eight of their last ten games, pushing their winning percentage over .700 to .702. The Sox got more great pitching from Logan Allen, who started and went four scoreless innings while allowing just two hits and no walks with four strikeouts. He has now allowed just 12 hits and two earned runs in 20 innings pitched this season. He also has a strikeout-to-walk ratio of 24-1. Yankory Pimentel got the win in relief, improving to 4-0, as he allowed two earned runs in three innings while striking out four and walking one. Carlos Garcia closed it out by tossing two scoreless innings with three strikeouts. 2015 11th round selection and 17-year old Nick Hamilton had a nice day out of the number nine spot, going 2 for 3 with an RBI and his seventh stolen base. Raiwinson Lameda had a pinch-hit RBI double in the seventh inning that proved to be the decisive blow. Isaias Lucena also had a pinch-hit single after Devon Fisher walked twice and scored twice. Roldani Baldwin went 2 for 4 with a pair of singles as well. Player of the Night: In a huge game for Greenville, left-hander Jake Drehoff turned in an excellent outing. He helped the Drive pick up a game in the standings by going six innings and allowing just two hits and no walks. The start was just Drehoff's sixth of the year, but he made the most of it. He's been very valuable for Greenville, making 16 relief appearances as well. Overall, he has a 2.74 ERA and an impressive strikeout-to-walk ratio of 59-13 in 62 1/3 innings this year.